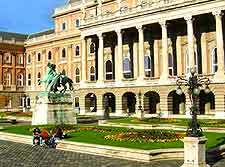 There are many beautiful buildings and important Hungarian landmarks spread around Budapest that tourists are always advised to bring a camera. 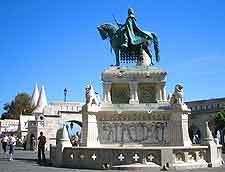 Many monuments lie next to the River Danube and celebrate the city's past, providing a clear insight into days gone by. Landmarks to look out for in Budapest include the Citadella (Citadel) on Gellért Hill, the riverside Fisherman's Bastion and the Old City Walls, which once completely surrounded the historic city of Pest and were built as a somewhat unsuccessful defensive barrier. 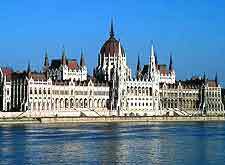 Also of interest to many is the Roman theatre of Aquincum, the former name for Budapest, and the simply magnificent Hungarian Parliament Building, which dominates the Pest side of the city. Located next to the Danube and within the Buda region, Fisherman's Bastion is an eye-catching landmark, with no less than seven towers and beautiful bright architecture. 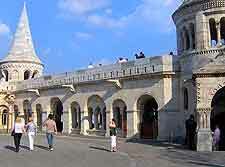 Construction of the Bastion commenced in 1895 and was completed seven years later. Ever since, visitors have flocked here to climb to the top and photograph the surrounding cityscape. Standing proudly at the very top of Gellért Hill, the Budapest Citadella overlooks the city and the River Danube, which is located at more than 200 metres / 656 feet below. Constructed in the mid-19th century, the Citadella was used as a lookout and fortress, and military exhibitions and bunkers are just some of the attractions, along with the Liberty Statue, Wax Museum, Cave Church, a restaurant and even a rather pricey hotel boasting some of the best views possible. 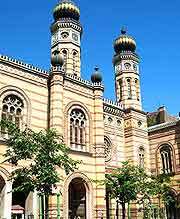 The ultimate Jewish landmark in Hungary, if you stand in front of the Great Synagogue and look upwards you are guaranteed to gasp. This really is a breathtaking structure and is one of the largest and grandest of all synagogues ever built. Outside, the twin tower dominates the facade, topped with onion-shaped domes, while the interior is equally impressive and can easily seat 3,000 visitors. Budapest's Dohány Street Synagogue was completed in 1859, although it was reconstructed following considerable bombing damage during the Second World War. The Old City Walls sadly did not serve its purpose when the Mongols attacked many years ago. Today, a number of stretches are still standing around the city and offer a glimpse of Budapest's rich and fascinating medieval past. The highest hill in Budapest provides a scenic natural backdrop to the city and at more than 500 metres / 1,640 feet in height, those prepared to climb to the top will be treated to some awe-inspiring views. However, if you are not feeling quite that energetic, then a railway and chairlifts are on hand. 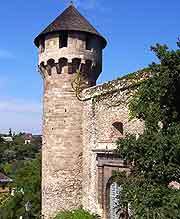 A historic lookout tower is also of interest. If you are not in a rush, bring a picnic, sit down and breath in the views. Reflecting in the adjacent River Danube, the Hungarian Parliament Building is every bit as spectacular today and it was when it first opened in 1904. With a grand central dome set between two tall spires, this is one of Budapest's finest landmarks and resembles a palace in appearance. Around 40 million bricks were used during its 20-year construction, along with some 40 kilos of gold - no expense was spared. 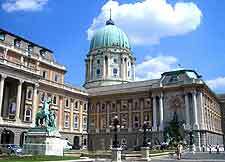 Known as either the Royal Palace or alternatively Buda Castle, this beautiful creation presides over Castle Hill. Whilst royal residences have been built atop this hill since the 13th century, the oldest part of the current Royal Palace dates from the 14th century. Linked by a cable car ride (siklo), which runs from nearby Clark Adam Square, the palace houses an array of local treasures and art works, within a series of museums and gallery spaces. 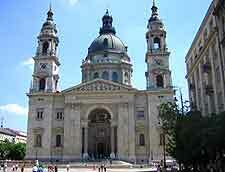 This spectacular religious landmark is quite like no other in the whole of Hungary and is simply enormous. Named after Hungary's first king, the very top of the basilica's dome measures almost 100 metres / 328 feet high, making its the joint-tallest structure in Budapest, along with the Hungarian Parliament Building. The cavernous interior is equally impressive and can accommodate literally thousands of people. A viewing platform is available high up and provides a popular vantage point.